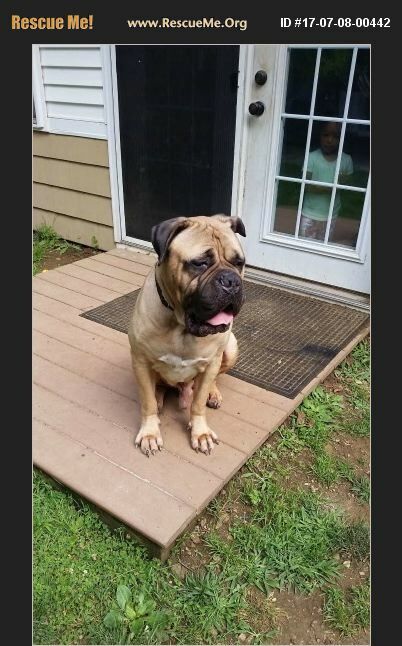 Rhode Island Bullmastiff Rescue View other Bullmastiffs for adoption. PLEASE READ THE COMPLETE BIO AND SUBMIT AN APPLICATION (available at www.bullmastiffrescuers.net under Forms to Download) BEFORE CONTACTING US. WE DO NOT RESPOND TO TELEPHONE INQUIRIES. Hi, my name is Koby, I am a big, beautiful, 6 year old male bullmastiff looking for my forever family. I am neutered, up to date on vaccines, housebroken, crate trained, heartworm negative, microchipped, and doing well working on my leash manners. My favorite pastimes are chewing on my bones and toys, chasing my ball, watching over my yard, enjoying ear and belly rubs, and just laying next to my people. I am very mellow and low key in the house, and I love everyone I meet - including kids! I happily live with two 2 year olds and a 9 year old, and I really enjoy their company! I am a very big boy, over 120 pounds, and my new family MUST have large breed experience. I have a strong prey drive, so it's important I'm the only pet in the house and that I can have a fenced yard. If your family would like to provide me with the home I deserve, please complete the adoption application at http://www.bullmastiffrescuers.net. I am being fostered in RI. However, don't let my location be a barrier. If you think I am the bullmastiff for your family, BRI can arrange my transport!